The gateway drug of the blues for me was The Rolling Stones. My initial exposure to the Stones was their early- and mid-sixties period, when they were releasing good albums and some of the greatest singles ever recorded. It was the lesser-known album tracks that opened the door. “Confessin’ the Blues”, “The Spider and the Fly”, “I Just Wanna Make Love To You” and others were raw slices of blues, and their other songs were heavily influenced by the genre. From the Rolling Stones it’s only a short walk to the Animals, the Yardbirds, and John Mayall’s Blues Breakers. It was the Yardbirds and Mayall who blew up a passing interest into a full-blown obsession because both of those bands provided the seeds for others. From the Yardbirds and Mayall came Clapton; from the Yardbirds came Jeff Beck and Led Zeppelin; from Mayall came Fleetwood Mac and the addition of the virtuoso Mick Taylor to the Stones. Hendrix was in the mix as well, playing his blues from Mars. The Butterfield Blues Band was also there. As I was listening to these bands, and others from the era ranging from Ten Years After to Savoy Brown, the originators of the style of music were unknown to me. That all changed when the connection was made. In a record store one day I found an album called Muddy and the Wolf, featuring members of Butterfield’s band, the Rolling Stones, Traffic, and Cream. Later I found out that the album was a repackaging of Muddy Waters’s Fathers and Sons and Howlin’ Wolf’s The London Howlin’ Wolf Sessions, but when I handed over my money to the good folks at Tapeville USA I just thought it was some supergroup I’d never heard before. When I listened to it, I was hooked. Like a lot of people, I expected the old blues players to be croaking vocals about bad times while playing rudimentary acoustic guitars. I was floored by both Muddy Waters and Howlin’ Wolf. For whatever reason, at a time when the Human League and Soft Cell were all over the radio with heavily synthesized pop tunes, there was something in this primal music that grabbed me by the ears and demanded that I pay attention. This music was completely unfashionable but that didn’t matter. It was real. Once I learned that the originators of blues music, those old black guys from down South and from Chicago were actual players and, in some cases, virtuosos, it became a quest to find out more. My first stop after Muddy and Wolf was B.B. King. I’d heard about King from interviews with Eric Clapton. Of particular interest was Clapton’s quote from a 1968 Rolling Stone interview: “I don’t think there’s a better blues guitar player on the planet than B.B. King.” This coming from Clapton? That’s some serious high praise. My first experiment? Live in Cook County Jail. And again, I was hooked. For rock fans King is known as the guy who took one of Bono’s most pretentious lyrics and rooted it in the ground on U2’s “When Love Comes To Town”. Others know him for his biggest hit single, “The Thrill Is Gone”, a fluke pop hit in the late 1960s that still retains its power all these years later. But King’s canon has many joys. The greatest is probably Live at the Regal, often considered one of the greatest live albums ever recorded. It is the concert stage where King worked best. On stage, King could play with an abandon that was often lacking in his studio work. He filled his songs with thunderous vocals, searing lightning fills on the guitar, and his often very funny stage banter (listen to “Worry Worry” from the Cook County album). And above it all, towering over everything, was THE NOTE. The note changed, of course, depending on the solo or the song in which he unleashed it. But it was always there. The band would chug along, King would stop singing, he’d play a handful of notes, and then hit it. One note. One string. That note would never end. Each one of these, over tens of thousands of live shows, can probably still be heard by the most sensitive recording equipment. THE NOTE would ring out, louder, higher, and clearer than any note that had ever been played by any guitarist. The sustain would go on…and on…and on. The band continued playing while that single note stopped time and let everyone on that stage, and everyone listening, know who was boss. When the note finally faded, it was usually followed by another quick blast that would put Eddie Van Halen to shame. King’s virtuosity was not technical, it was emotional. 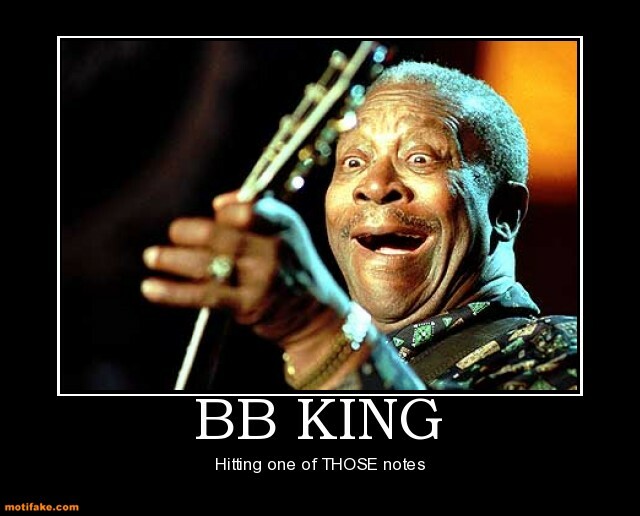 He was one of the greatest of all the blues legends, a towering figure in 20th century music. His name should be revered and held in the same company as Armstrong, Sinatra, Parker, Coltrane, Hendrix, Davis, Lennon, Presley. Muddy Waters and Howlin’ Wolf made better records because they were able to capture their live sound on tape, but Riley “B.B.” King stands at the top of the list of blues musicians. 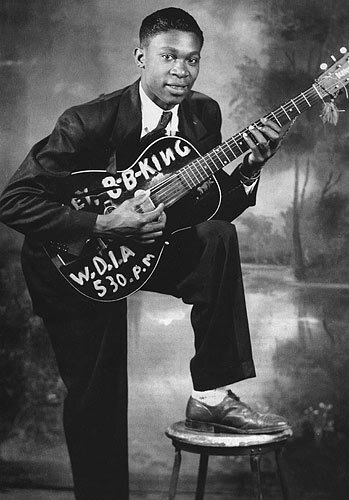 He influenced every blues guitar player who came in his wake. His voice is silenced now, as is Lucille’s. The notes live on forever. RIP.